Strawbees is a prototyping tool and toy for makers of all ages. It was first introduced in 2014 via the company’s successful Kickstarter campaign. 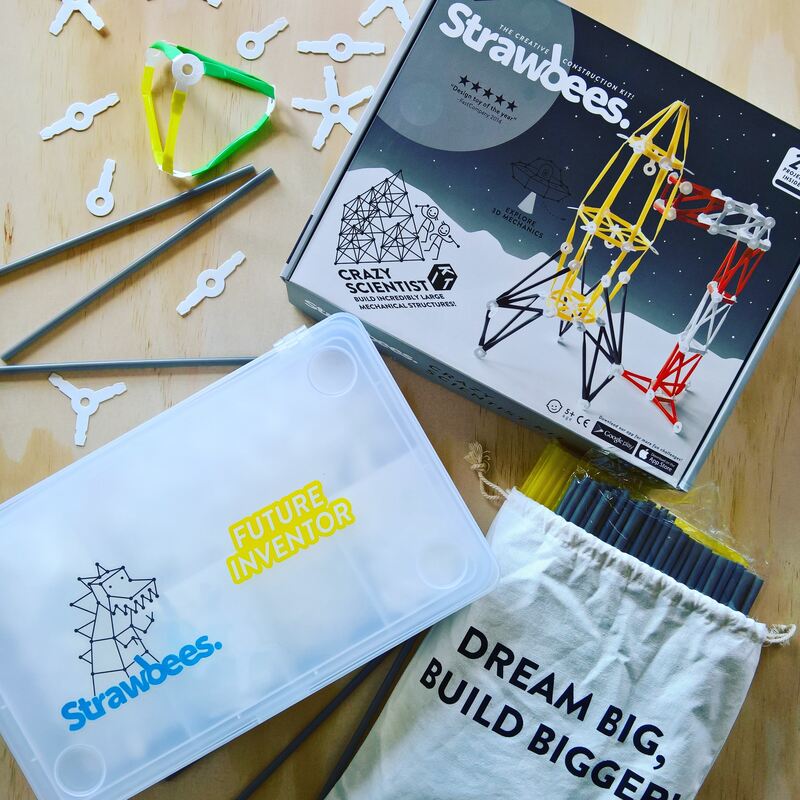 The concept is simple: Using Strawbees connectors, you can put together plastic straws (very much like your regular drinking straws) or cardboard pieces to create different things – from basic 3D shapes to complex mechanical objects. I didn’t know about Strawbees until a couple of months ago. But, the moment I found out what this tool can do, I knew I just had to try it. So, I purchased one of the kits (Crazy Scientist Kit) and used it in the STEAM* Club that I run for a local school here in Adelaide. And, I’m here to review the kit that I used. Strawbees are so much fun to use! The kids absolutely loved working with the straws and connectors. Strawbees are great for teaching structures, design, geometry, and more. And, several creations may be related to real life use. Strawbees kits come with a basic instructions booklet to get you started. You can also find more projects using their free app (available via iOS and Android), their Maker Activities page, and their Learning Portal. Strawbees can be extended with different STEAM tools like Quirkbots, littleBits, Hummingbird robotics, etc. You might even consider connecting them with regular motors and battery packs. Strawbees classroom kits are relatively inexpensive compared with many STEAM tools. And, you don’t have to purchase the branded straws. There are regular drinking straws that you can use with Strawbees connectors. Sample work by STEAM Club Students in Adelaide, Australia. Introducing Strawbees to students is simple. But, it might take a little bit of time for students to grasp the full extent of the tool’s capabilities (not necessarily a bad thing!). Some of the tutorials available may be a little confusing to some students, so there might be a need for more hands-on guidance at the start. The connectors can be a little tricky to use at times, especially when not using standard straws. It’s especially tricky when attaching connectors to other connectors. You might need to fold or snip (not easy for younger students). Some of the available projects in Strawbees booklets and online tutorials might not work as well as you hope at the start (e.g, the catapult). So, you might need to make some adjustments. While relatively inexpensive as a STEAM tool/kit, it can get expensive when using for several students if Strawbees are not re-used/recycled. That’s why it might be worth considering getting their Infinite Kit (or their Upcycle Station for two full sets, including Quirkbots) if you’re planning to use Strawbees on a regular basis. Strawbees are definitely worth the investment! It’s a wonderful addition to any STEAM or maker classroom or lab. Maker Kit – This is their introductory kit that comes with 200 pieces (straws + connectors), with an instruction booklet containing 16 projects. It costs around US$20 (AU$25-30). Inventor Kit – This is the intermediate level kit that comes with 400 pieces (straws + connectors), with an instruction booklet containing 20 projects. It costs around US$40 (AU$40-50). Crazy Scientist Kit – This is the advanced level kit that comes with 1000 pieces (straws + connectors), with an instruction booklet containing 21 projects. It costs around US$80 (AU$80-100). There is also a School Kit, which comes with 2560 Strawbees connectors, 1500 straws, and a Card Deck of Creativity (with US$20). It costs US$295 (AU$400). *In case you haven’t heard of STEAM yet, it stands for Science Technology Engineering Art Mathematics. Take Part In A STEAM Class or Workshop!